Build your creative teaching voice and learn to inspire a future generation of artists. The online Master of Arts in Art Education (M.A. 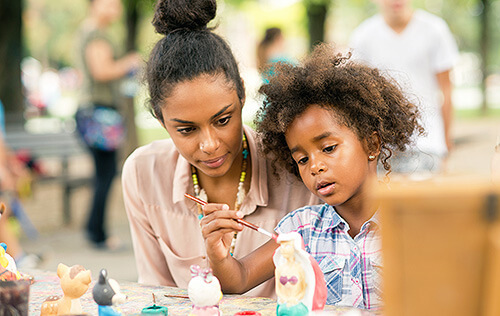 in Art Ed) program offered by Adelphi University’s College of Education and Health Sciences blends creative practice and interdisciplinary teaching approaches to prepare students in becoming successful art teachers who cultivate the rich connections young people can make through art. Expert faculty provide highly personalized coursework with unique hybrid scheduling, enabling students to take courses online while completing in person fieldwork in New York K-12 classrooms. Gain the hands-on artistic teaching experience and career planning support you need to become a skilled art educator. We are well prepared to help you explore the role of art in education through meaningful fieldwork placements and student teaching environments no matter where you live in the State of New York. Special student teaching abroad placements are also available. A high concentration of the arts in a city leads to higher civic engagement, more social cohesion, higher child welfare, and lower crime and poverty rates. To learn more about Adelphi University’s online Master of Arts in Art Education, fill out the fields to download a brochure or call us at 888.252.4110 to talk with one of our enrollment counselors. The online Master of Arts in Art Education does not accept international students. Nearly half of the nation’s healthcare institutions provide arts programming for patients, families, and staff. Our blend of online learning and onsite classroom experience offers a convenient educational option to become a creative art teacher and become eligible for New York State teaching certification. Well-connected, deeply dedicated faculty members with extensive experience and attentiveness to the unique aspects of the roles art plays in education across the lifespan. Receive fieldwork and student teaching support no matter where you live in New York and benefit from a curriculum geared to teaching certification. A personalized experience with a wide range of electives to meet your career goals and strong advisement to support you each step of the way—with coursework, fieldwork placements and certification. Adelphi’s College of Education and Health Sciences is committed to excellence in education and providing opportunities for professional growth by creating authentic academic and field experiences, cultivating respect for the diverse population we serve, embracing ethical practices, and preparing our students to become reflective change agents through research, collaboration and leadership. Our educational philosophy stresses the value of learning through meaningful activity and reflection within a community of scholars and educators. We recognize learning as a socio-cultural dynamic and as such, our classes are framed within the cultural, historical, and material contexts of the diverse populations we serve. Our philosophy leads to collaborative communities that honor the voices of all and hold the greatest promise for individual as well as collective efficacy. As lifelong learners themselves, our faculty and administration value creative expression and artistic exploration for personal and professional growth and are committed to recognizing and attending to our students needs through the development of leadership, technological and communication skills.